Awwwwwwww. This was such a heartwarming story! Every kid gets a monster, a monster that finds and chooses the child--that's how it'd done. 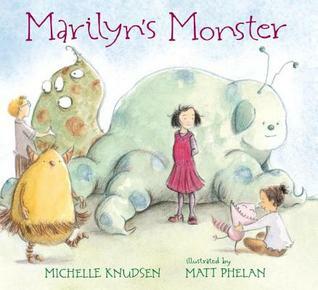 One by one, all the kids at school get monsters, but Marilyn's hasn't shown up. Everyone tells her to be patient, but it's hard when everyone else gets to play and bond with their monsters and she still doesn't have one. She waits... she puts up with her brother saying she'll never have a monster choose her... and then she sets out to find her monster. No, that's not how it works, but she does it anyway. And when she finds her monster stuck in a tree, unable to get to her. "I got lost," her monster said in his small, soft voice. "And then I got scared. And then I got stuck." Awwwww. So Marilyn and her monster finally find each other. Of course, this is also a story about the reality that--as an adult--I have yet to embrace: that there are lots of different ways things can work and sometimes you have to trust your heart and do what you think is right, even if it's different from what everyone else is telling you. I loved the drawings in this book. There are SO MANY different kinds of monsters, so creatively imagined. And each kid's interests/personality is evident in his or her monster. I have read this book several times now, really enjoying the fun personalities and creative looks of each of the monsters. One rides a bike, one looks like a beanbag chair because its kid likes to sit and read, one is gigantic and fights off bullies, one has the same smile as its kid, etc. Such a good story warms my heart, but such illustrations make me want to read the book over and over again. And it makes me wish I had my own monster!